Why Does it Matter and How Does One Get Verified as Accredited? When must investors in a syndication deal be Accredited, and when can Non-Accredited Investors participate in the opportunity? Sometimes the answer is not clear-cut, which is why it’s always a good idea to consult with a Securities Attorney. Before delving into that question, let’s consider different levels of investor qualifications. A “Sophisticated Investor” is one who, alone or with his or her purchaser representative, has such knowledge and experience in financial and business matters that he or she is capable of evaluating the merits and risks of the prospective investment alone, or with assistance of a purchaser representative. To meet this definition, one generally must have more than a job and savings. Acceptable knowledge or experience could be based on such things as someone’s college education (e.g., a finance degree or MBA), business ownership, or past real estate or stock market investing experience. An “Unaccredited Investor” is everyone else not defined above. These may be people who have a job and savings, but are not savvy investors. Most likely they are your friends and family who are interested in supporting you, as the issuer of the securities. So why do Investor qualifications matter? Because before anyone can sell securities (i.e., promissory notes or investment contracts) to private investors, they must either register the investment (by getting regulatory pre-approval to make a “public offering”) or by qualifying for an exemption from registration. The exemption you choose will determine: a) the financial qualifications of your investors, b) whether you can advertise or if you can only offer the opportunity to people with whom you have established a substantive pre-existing relationship, and c) what kind of risk disclosure document, if any, you need to provide. In addition, most exemptions require some type of filing with federal or state securities regulators (or both) notifying them which exemption you are claiming and giving them jurisdiction over you in case you do it wrong. How does one prove he or she is Accredited? Let’s suppose an issuer has selected the Regulation D, Rule 506(c) exemption which requires that investors be verified as Accredited. How, then, does one become verified, or otherwise prove that he or she is Accredited? 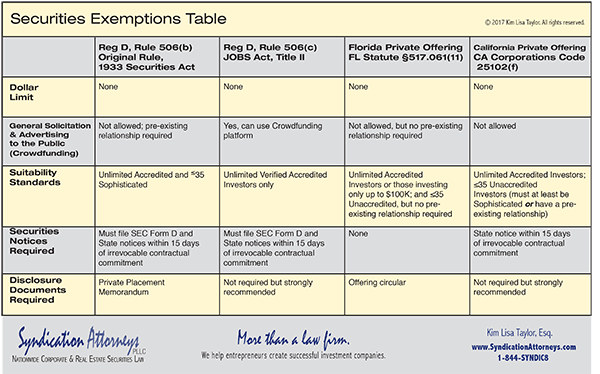 In the case of Regulation D, Rule 506(b) Offerings or for the Florida or California private offering exemptions shown in the table, investors can self-certify by answering a set of questions (usually in the Subscription Agreement that accompanies the offering documents) designed to see whether they meet one of the SEC’s eight definitions of an Accredited Investor or if they meet one of the other qualifications for a specific offering of securities. (4) A certified public accountant in good standing. (D) In regard to any person who purchased securities in an issuer‘s Rule 506(b) offering as an accredited investor prior to Sept. 23, 2013, and continues to hold such securities, for the same issuer‘s Rule 506(c) offering, obtaining a certification by such person at the time of sale that he or she qualifies as an accredited investor. Because each exemption has its own set of rules, this is where an experienced securities attorney can be invaluable. An experienced securities attorney can help you determine which exemption is the best fit for your circumstances as well as help you fully understand and comply with its requirements. Further, he or she will offer structuring advice regarding how you should split profits with investors and the appropriate investment contract to use with investors for the type of assets your syndicate is acquiring. Without this counsel, you are likely to misstep, and the consequences can be dire, both for the issuer and its investors.